Proximity based solutions are on a rise since last few years. It is very logical and convenient use of technology to engage your customers or users. It is all about information that can be provided which is physically relevant and timely in manner. Physical Web was a big part of Beacon based solutions, especially at times when the IoT based solutions and implementations are growing by leap and bounds. Wait… ! 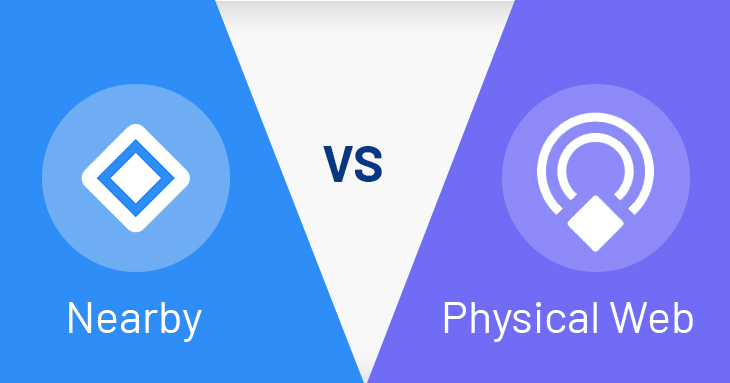 What is Physical Web? The Physical Web was a Google trial where beacons broadcast their URLs to the Chrome browser. The Physical Web project made it easy to deploy beacons on an open and distributed standard. You did not need a mobile app of your own for the same. Chrome App was sufficient for the same. This was supposed to be revolutionary enough to change the landscape of Beacon based solution implementations. Well.. Google had some other plans. Developers and clients alike were took by surprise and were highly disappointed when Google stopped supporting Physical Web on iOS Chrome and Android chrome in late 2017. After all, Physical Web was the future of Proximity based solutions. The messages like the following one became very common in the developer community. Physical Web as future for Proximity based solutions is not an option any more. Physical Web is dead. Long live Physical Web!..! Google of course was not backing out from Proximity based solution market. All it was doing actually was enhancing it by killing Physical Web. I think Google had some strong logic in killing Physical Web. Actually, Physical Web is not dead, but just got an upgrade in form of “Nearby” notifications. Of course, at cost of some openness and decentralization which Physical Web Project championed, Google Nearby does seem more useful in terms of requirement which the business actually have. The APIs that Google Nearby support do have more functionality than the Physical Web project e.g. Peer to peer messaging, connectivity for devices in proximity to each other, etc. You know your business. You know your target audience. Grocery stores have heavy traffic on weekends and roads have heavy traffic on weekdays. You know what is the best time to send notifications to your users which will have higher conversion rates. Nearby allows notifications to be sent at a specific time of the day, or days of a week. Well, you cannot do this with Physical Web. It was bit dumb in nature compared to Nearby. Physical Web will only send notifications when the user enables scanning. Nearby, on the other hand, is designed to run and scan quietly in the background. Bit intrusive ? Yes. But you always have those not so user friendly settings somewhere to stop Nearby do this. From perspective of your business, you can target users proactively without they taking any action for it. This is a huge advantage for Google Nearby over Physical Web. Apps using the Nearby API, send telemetry information to the Google beacon platform where you can monitor the health of your beacons. This report contains the battery level, count of frames that the beacon has transmitted, length of time the beacon has been active, beacon temperature and much more. This will tremendously help you to monitor the functioning of the solution which you have deployed. The best part for me is the Nearby’s ability to send different notification to someone who has installed an App than to someone who does not have the mobile App. It is not totally static like Physical Web where in you are talking just to a single link. As a developer or a business owner, you would like to approach differently to someone who has installed an App v/s someone who has not installed your mobile App. E.g For someone who has not installed the App, you can offer some promotion items for install and first time login. If someone already has an App, you can notify them or some other kind of discount. I believe eventually it will be taken to next level soon where in you can do a lot more. Google themselves label Nearby connections as, “simple publish and subscribe methods that rely on proximity”. Nearby messaging connections are Peer to Peer in nature and do not require network connectivity. They work purely on Bluetooth Protocol. Nearby allows the Apps to easily discover, connect to and exchange the data with nearby devices in real time. For a new feature, Nearby Notifications is what allows website developers and mobile app developers to tie an app or website to a BLE beacon and create contextual notifications, even with no app installed. This is what has replaced Physical Web. Or should we say upgraded Physical Web. How Let’s Nurture can help for Proximity based Solutions? We at Let’s Nurture provide IoT based solutions mainly using beacons and tracking devices. We have deployed Proximity based solutions for Museums, PoS and at various location based events. Our team is well prepared and we can define and develop a Proximity based solution for your ever evolving requirement which will be scalable, quick and effective for your business. If you want to know more about custom mobile app development, BLE App development, latest Proximity based solutions, IoT solutions, website development or anything else you want to implement for your business or an idea, get a FREE consultation now. We would be happy to help you! !